Riding up the Rainbow valley early morning. Spring - a mixed bag!! Spring is normally associated with a mix up of the four seasons often during one day and certainly it has been a “real’ spring here this year. Reflecting this is my own mixed bag of conflicting late season ambitions and it seems inability to leave the house for more than a day at most. Locally, benefiting from larger than normal snowfalls in the Arthur ranges, it has been possible to get plenty of good short trips in whilst kids are at school. However there has been the frustration of not been able to get much further afield. Throw in a bike though and interesting one day trips into the Nelson Lakes area of the Southern Alps become possible although usually needing quite a considerable amount of physical and mental effort. I have been lucky recently to have Jake as a partner in some of these trips to help carry the pace. An adventure racer he push’s hard and fast all day - something which is necessary to achieve much in 24 hours and he has the added bonus of being an experienced mountaineer. The photos below are a compilation of our 2 most recent trip’s this spring. Lee’s Stream , in the Raglan ranges just after dawn - we didn’t know it yet but we had a long hard day coming up to climb a peak with only a number - 2152. Jake contemplates our failure on a rock route behind us at the start of the climb. Desperation peak - that's what I think I'll call it from the amount of times Jake times I heard Jake utter the word “desperate” in front of me - been rather faster and more competent than me on treacherous terrain his desperate is my hopeless. Anyway after 3 or more hours trying we finally found a route off first base. Jake push’s thru waist deep snow. a narrow ridge heading to the summit. The summit was one km away still. That doesn’t sound far but with 9 fairly hard hours already in the legs it was starting to get difficult. The tracks are from Chamios, alpine goat- antelopes who inhabit the upper reach’s in droves. Looking west , down Lee stream to the Nelson lakes. Looking South to the Anvil and Southern Raglan’s. The strain is starting to show - starting the walk out to our bikes , 14 hours in legs , still several to go. Another day, another ride in . Wading through the mist’s up to another little climbed peak, this time 2136 m in the Nelson lakes. 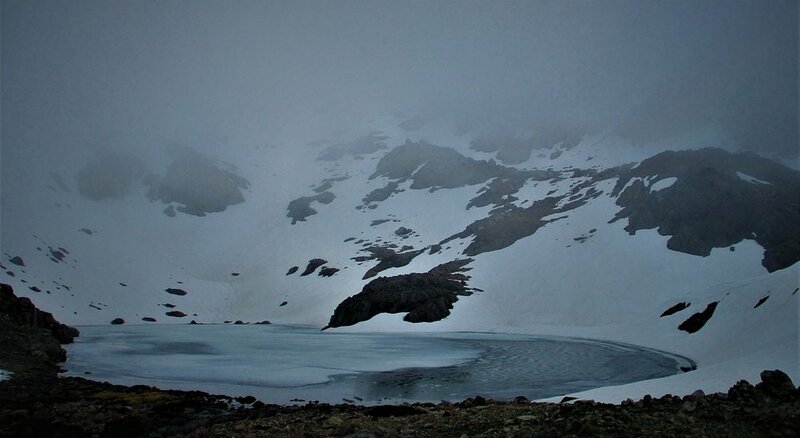 As we descended the mist’s cleared to reveal this hidden tarn. The various colors of melting ice couldn’t be captured in a photo. Finally, as we descended we saw the mountain bowl we had been in. The Rainbow river and our bikes are still a long way below! The route revealed - post climb!! Jake’s face tells it all!! Still the ride out- or in this case push out. The clearing in the weather had been brief and spring storms were rolling in.